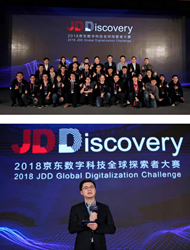 Holding a world-level competition shows JD Digits’ strong confidence on its cutting-edge technologies and profound understanding of digitization. JD Digits expects to discover more technology talent around the world, to explore more possibilities of data technology with them. JD Digits, the leading digital technology company in China, gave out a record prize to winners of its annual global competition that took on social challenges including predicting population growth and building a better driver-less vehicle. Two teams—“WH” from the Mainland China division and “Cheese&Chips” from Israel division, shared the global championship of 2018 JDD Global Digitization Challenge. Each received a prize of 500,000 RMB (USD 70,000) and job offers from JD Digits. Both topics were designed to solve challenges that real industry faced. The question related to population was designed to lower the cost of conducting national census and to improve prediction efficiency. Teams were ranked according to the accuracy of predictions. The mapping question tried to overcome key technical difficulties in current unmanned driving positioning field, such as lidar map differences and compensate for the defects of sensors. Teams were scored according to the best overall positioning and orientation accuracy they can achieve. Since November 2018, there were more than 2,100 teams with over 3,000 young professionals and students from different countries participating in the challenge, such as China, US, Spain, Israel, Russia, UK, Canada, and France. Besides high prizes, young talents were also attracted by the great opportunity of drawing a closer relationship with real business and market. “We thought it was more about introducing algorithms and technologies, but we know better how to pitch to the real business world through the competition now,” said Yu Haibin, team leader of “Cheese&Chips” and PhD candidate at the National University of Singapore. The mentors and judges who joined the competition included global AI and Big Data experts, industry leaders, and top investors such as Che Pinjue, Expert Partner at Sequoia Capital China; Leo Cui, Founder, and CEO of TalkingData; Li Zhenjun, CEO of China Unicom Smart Steps Data Technology Co. Ltd.